Should you get the new Miles & More Diners Club card? This is part 2 of my review of the new Lufthansa Miles & More charge card in the UK. 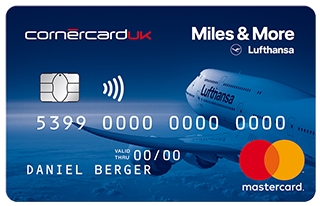 Part 1 – click here – looks at ‘the facts’ about the new UK Lufthansa Miles & More credit card (which isn’t a credit card). This article is my personal view on whether the cards are worth getting. It also comes with a Pre-Paid Mastercard …..
It’s a weird structure but it shouldn’t impact your decision on whether to apply. Should you get the cards IF you already collect Miles & More miles? You are paying a £79 fee but getting a bonus of 10,000 Miles & More miles. These are worth more than £79 if used well. There is no spend target with the bonus arriving after your first purchase. Having the card stops your existing Miles & More miles expiring. A lot of people will (reluctantly) end up paying £79 per year long-term for this card simply to protect their valuable existing stash of miles. Remember that Miles & More miles usually expire three years after you earn them irrespective of your activity. I personally have 200,000 Miles & More miles, worth £2000+ of free flights, and paying £79 to safeguard them is a price I will (un)willingly pay. Should you keep the cards after the first year? Tricky. Whilst the earnings rate is excellent, the £79 fee is high. The more you spend, the better value it is – I run some numbers below. You may feel you need to keep it just to keep your existing balance from expiring. Should you get the cards if you DON’T already collect Miles & More miles? Put another way, is this a good reason to start building up a Miles & More balance? Lufthansa Miles & More miles get you access to ‘free’ flights on all airlines in Star Alliance. You can redeem on these carriers: Adria, Aegean, Air Canada, Air China, Air India, Air New Zealand, ANA, Asiana, Austrian, Avianca, Brussels, Copa, Croatia, Egypt, Ethopian, Eva, LOT Polish, Lufthansa, Scandinavian, Shenzen, Singapore, South African, Swiss, TAP Portugal, Thai, Turkish and United. With a Star Alliance balance alongside an Avios / oneworld balance, you’ll never be short of airlines to redeem with. The real value is in long-haul Business Class and First Class redemptions. This means that you need lots of miles, unfortunately. A relatively modest redemption (UK to Dubai in Business Class) is 70,000 miles return plus £516 in taxes and charges. This is, admittedly, cheaper than using Avios (100,000 Avios off-peak or 120,000 Avios peak with similar taxes) but is still a lot to earn purely from card spend. You cannot earn additional Miles & More miles by converting American Express Membership Rewards points as Lufthansa is not a partner. The best indirect Membership Rewards route is to transfer to Marriott and onwards to Miles & More which is an effective rate of 0.5 M&M miles per Amex point. This is not great. You CAN transfer Marriott / Starwood points earned from the Starwood Preferred Guest American Express card to Miles & More. You would get 10,000 Miles & More for signing up and converting the 30,000 bonus SPG / Marriott points. Having the Starwood Amex card does NOT stop your Miles & More miles from expiring though. You can top up your account in other ways, such as crediting the occasional hotel stay or car hire, or transferring Heathrow Rewards points, but you will struggle to find ways of earning lots of Miles & More miles apart from the card or flying. You CANNOT form a Household Account unless you live in Germany, Austria or Switzerland. How does this card compare with other Visa or Mastercard products? 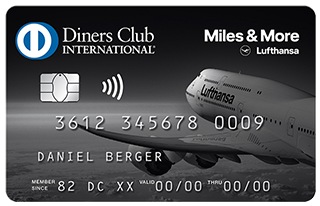 Lufthansa Miles & More Diners Club / Mastercard – earns 1.25 Miles & More miles per £1 which I value at 1p each. Annual fee £79. IHG Rewards Club Premium Mastercard – earns 2 IHG points per £1 which I value at 0.4p each, and you get a free night each year (which I value at £250) if you spend £10,000. Points count towards status so top-tier Spire Elite is triggered with £37,500 of spending even if you have no IHG stays – this earns you a bonus of 25,000 points which I value at £100. Annual fee £99. Virgin Atlantic Reward Mastercard – earns 0.75 Virgin Flying Club miles per £1 which I value at 1p each, comes with a companion or upgrade voucher for spending £20,000 which is hard to value. No annual fee. Virgin Atlantic Reward+ Mastercard – earns 1.5 Virgin Flying Club miles per £1 which I value at 1p each, comes with a companion or upgrade voucher for spending £10,000 which is hard to value. Annual fee £160. IHG Rewards Club Premium is the clear winner at £10,000 of annual spend with a 2.3% return. IHG Rewards Club Premium is the clear winner at £20,000 of annual spend with a 1.65% return. All three of the paid cards are fairly evenly balanced at £50,000 of annual spending at around 1.1%-1.3% return. At very high levels of spend, the Virgin Atlantic Reward+ card has the edge. That said, it is close enough to the Miles & More card that I would base my decision on whose flight network I preferred and whether I would use the companion or upgrade voucher from the Virgin Atlantic card. Will I be getting the new Lufthansa Miles & More charge card? Yes, I will. 10,000 Miles & More miles for £79 is a no-brainer and it will keep my existing 200,000 miles alive. Will I keep it long term? I don’t want to, but I have little choice as long as I have a six-figure mileage balance at risk of expiry. Got Miles & More status? You don’t need this card, unless you have lots of Mastercard spend which cannot be put onto an American Express instead. The Starwood Amex is a more flexible option with the same earnings rate. You don’t need the ‘miles no longer expire’ benefit offered by this new card as elite members don’t suffer expiry. Collect Miles & More miles but don’t have status? For those with a Miles & More balance, this new card is a good way to top up your account and keep those miles from expiring. I fall into this category. For everyone else ….. the answer is “probably not”. You can only get good value for their miles on long-haul premium redemptions and only a big spender will earn enough purely from card spend. A better option for a Mastercard or Visa to use alongside – for most HFP readers – a British Airways American Express is the IHG Rewards Club Premium Mastercard or one of the two Virgin Atlantic Reward Mastercards. You can apply for the new Miles & More cards here. PS. In all seriousness, I am impressed by what Lufthansa has done here. It may be a weird structure, but they have succeeded where Emirates, Etihad, American and United have so far failed and got a new UK card to market – and one with a generous earning rate too. There will have been some interesting conversations at Avios, Hilton, Emirates, Etihad, American, United etc yesterday. What is availability like on Lufthansa redemption flights? Getting this card (to add to c. 15k points from Hilton promo) and playing a (very) long game to get a his-and-hers redemption of the Far East in c. 4 years will be a bit pointless if I can never book a pair of seats in business or first…! Fairly easy. We got 4 SWISS J to Dubai for half term on the day we wanted. Many thanks, do they release 355 days out per BA and are there guarantees about availability on any given flight?